From time immemorial Sri Lanka has had a sparkling reputation for highly treasured gems. 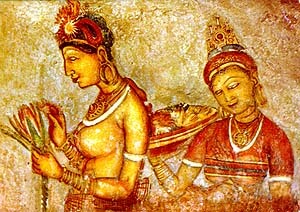 Nature in her bounty has chosen the bosom of Sri Lanka to enshrine some of her rarest treasures. Blue Sapphires, Cat's Eyes, Alexandrites, Rubies, Star stones found embedded in layer of gravel and sand, in river beds, marshes, fields or accumulated at the foot of hills have made Sri Lanka the renowned island for gems. These precious stones perfected in the laboratory of nature lay hidden of countless ages, their luster undimmed, their value unrecognized. 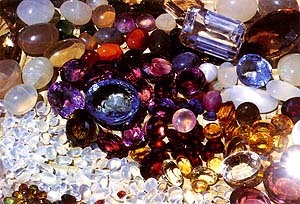 To read more about Sri Lanka Gems please follow this link. o adorn the "mirror wall" of the rock fortress Sigiriya in the northern plains of Sri Lanka. Painted in brilliant colors on mirror-finished plaster wall, some believe that they are asparas, heavenly nymphs. Perhaps they were ladies of the court on their way to the temple or even ancient "pinups" for the entertainment of the lonesome young ruler. Painted during the reign of King Kasyapa in the fifth century (A.D.), these frescoes have retained their brilliant colors until this day, protected from the sun, wind, and rain by the overhanging rock. Accompanying these frescoes are graffiti left by the ancient visitors, that are considered to be some 1,000 or more, years old. Although these speak of "five hundred damsels", today there are only eighteen to be seen. Note: Some 30 years ago, in 1967, vandals succeeded in obliterating several of these priceless frescoes, but with the help of the Smithsonian Institution in Washington D.C. they were restored to their former splendor. 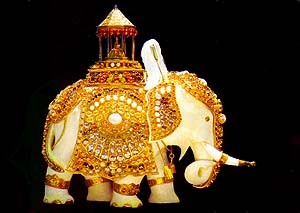 A Faberge' elephant?. No, not quite. Exquisite enough to be one though. This gem and jewelry adorned ivory carving is a part of a collection of gems and jewelry at one of the biggest gem merchants in Sri Lanka. Carving Ivory into intricate and exquisite objects has a long history in south-east Asia, where ivory was abundant at one time before the invading forces from the West discovered the mysterious East. The kings and queens in that part of the world always encouraged art, and artisans, jewelry makers, and painters among other various craftsmen were part of the Royal Entourage. They were provided with a livelihood free of day-to-day worries, so that they can spend their full time and effort to do what they were good at. This may have been the start of the Caste system that was prevalent in countries like India and Sri Lanka until mass communication and mass transport made intermixing between the various castes possible, and thus the end of the system. 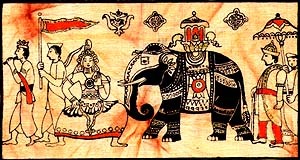 This carving appears to be that of Raja, the head elephant of Dalada Maligawa, the Temple of the Tooth in Kandy, carrying the sacred tooth relic on its back during the Esala Perahara. Wood panel from an old door ... 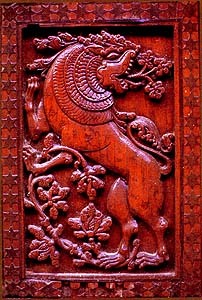 Lion has always been revered in Sri Lankan lore. After all, the major race in Sri Lanka, the Sinhalese , are supposed to be descendants of a lion. (Sinha, lion and le', blood in Sinhala, the language of the majority of the people). The lion is also prominently displayed on the flag of Sri Lanka. This wood carving of a lion, possibly part of a set, looks well aged from the appearance, and the fine patina that it has acquired. Most likely places to see native hardwood (teak, mahogany, ebony) panels like these are the old Buddhist temples, and some of the old mansions that belong to some of the established families in the country. Bellanwila Raja Maha Viharaya houses a series of painted murals depicting several episodes in the life of the Gautama Buddha. 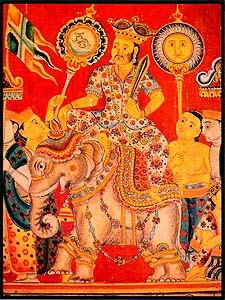 The largest of the murals - a full 6 metres by 14 metres, is a single unified composition depicting 13 episodes in the life of the prince, from early childhood up to the time of his enlightenment. 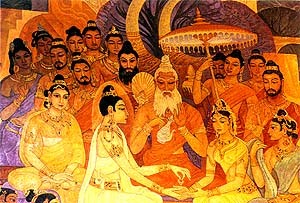 These include Siddhartha's education in music and the arts; his training as a young warrior in the martial arts, archery and swordsmanship, his marriage ceremony, his indulgence in sensual pleasures, his experiences traveling outside the place grounds (where the young prince witnessed the suffering that encountered him to seek a way to end all suffering), his association with hermits, ascetics and philosophers, and finally, his achievement of nirvana.